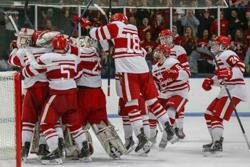 After their 3-2 victory over Wayzata in the section semifinals Saturday, Feb. 23, the Red Knights Boys Hockey Team will compete in the section 6AA finals on Wednesday, Feb. 27. To pre-purchase your tickets, stop by or call the BSM Athletics Office at 952-915-4346, or contact Jerry Pettinger at jpettinger@bsmschool.org or Judy Koski at jkoski@bsmschool.org directly. Monday, 2/25 - 10:00 a.m. - 6:00 p.m.
Tuesday, 2/26 - 7:15 a.m. - 4:00 p.m. Ticket Prices are $13.00 (adult) and $8.00 (student). No senior rate will be available. Only cash and check will be accepted, and checks should be made payable to BSM. All seating at 3M Arena at Mariucci is general admission.